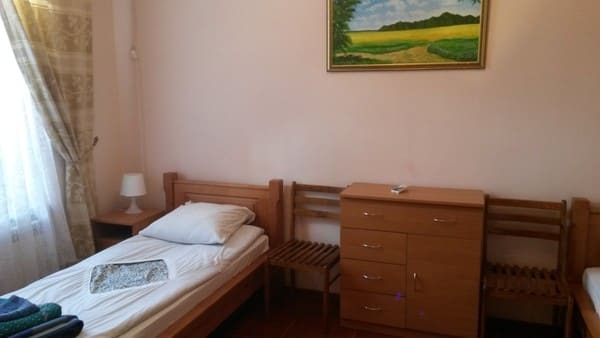 Cottage Guest house "Maisky" is located 500 meters from the city beach, and 300 meters from the Aleja Fairytale Park. 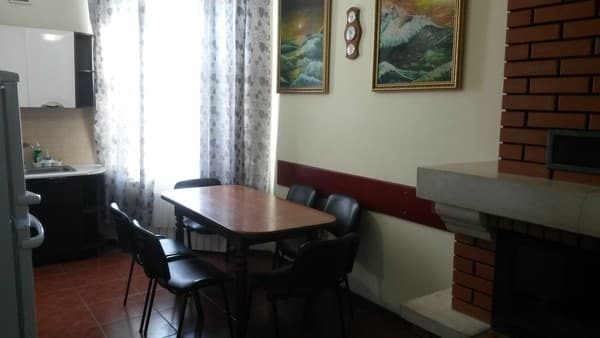 Guests of the Guest House for recreation are offered a 3-storey house with an area of ​​150 square meters. meters. On the first floor there is a bedroom with two single beds, a kitchen and a bathroom. The kitchen has all the conveniences for cooking yourself: a gas cooker with an electric oven, a microwave oven, a fridge, an electric kettle, utensils, round the clock hot and cold water. In the kitchen there is a fireplace, near which you can spend evenings in rainy, cold weather. The bathroom is equipped with a washbasin, toilet, a spacious shower cubicle and a washing machine. On the second floor there is a bedroom with two single beds and a bedroom with a large double bed and a sofa. Each bedroom has a bathroom with a shower. All 3 bedrooms and the third floor are equipped with air conditioning. The whole third floor is occupied by a games room / hall. 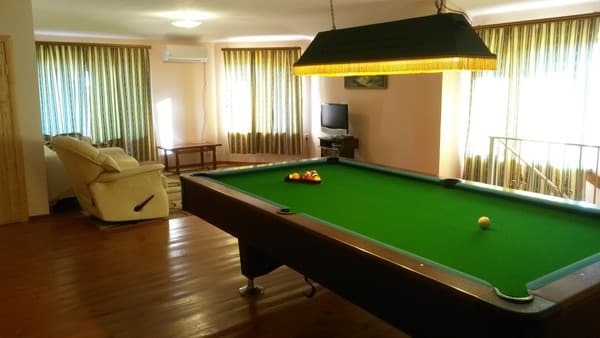 There is a pool table, a sofa, an armchair recliner, a coffee table, satellite TV, a video / DVD player and karaoke. The house has wireless Wi-Fi Internet, a cot, an iron, ironing board, clean bed linen and towels. General wet cleaning is carried out after eviction, using high-quality disinfectants. Cleaning and change of bed linen and towels - every 7 days. On the territory of the guest house "Maisky" there is a gazebo for rest, a children's sandbox, a swing. There is also a brazier for cooking shish kebabs. In a separate building there is a sauna with a small pool (the cost of a sauna is from 350 UAH per 3 hours). There is a place for free parking. Discount - 5% for a stay of 14 days or more. Distance from Cottages Guest house "Maisky" to the railway station 2.6 km, to the bus station 600 meters. 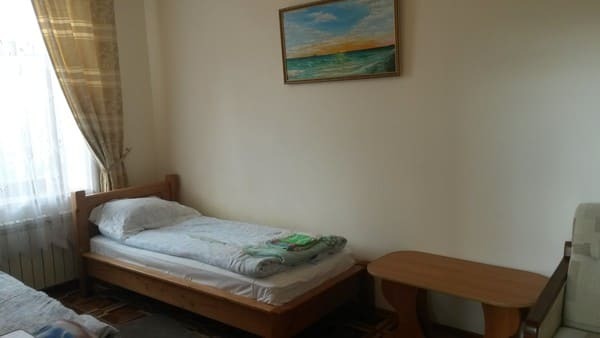 Description of the room: For recreation, a 3-storey house with an area of ​​150 square meters is offered. meters, consisting of 3 double bedrooms, a kitchen and a large games room / hall with a pool table. Each bedroom has a bathroom and air conditioning. On the first floor there is a bedroom with two single beds, a kitchen and a bathroom. On the second floor there is a bedroom with two single beds and a bedroom with a large double bed and a sofa. Each bedroom has a bathroom with a shower. All 3 bedrooms and the third floor are equipped with air conditioning. The whole third floor is occupied by a games room / hall. In it there is a pool table (pool), a sofa, an armchair recliner, a coffee table, satellite TV, a video / DVD player and karaoke. The house has wireless Wi-Fi Internet, a cot, an iron, ironing board, clean bed linen and towels. The house is designed for 8 beds, in addition there is a cot and a clamshell. The nearest cafes and shops are within 140 meters. 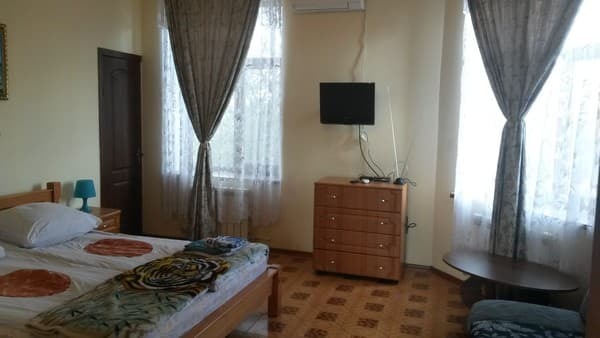 Cottage Guest house "Maisky" is located 500 meters from the city beach, and 300 meters from the Aleja Fairytale Park. Distance from Cottages Guest house "Maisky" to the railway station 2.6 km, to the bus station 600 meters. From the bus station walk 600 meters.